Exciting news! NAKIVO Backup & Replication v7.3 is now out of beta and available for download. We have added support for deduplication appliances to ensure the smooth integration of NAKIVO Backup & Replication into your virtual infrastructure. This integration is achieved through the use of a new backup repository type that is optimized for operation on deduplication appliances. This allows NAKIVO Backup & Replication to run perfectly with deduplication appliances, such as Quantum DXi, NEC HYDRAstor, EMC Data Domain, HP StoreOnce, etc. When tested in a customer environment, the new type of repository allowed NAKIVO Backup & Replication v7.3 to back up VMs 53 times faster than the regular backup repository. With a high-end NEC HYDRAstor deduplication appliance as the target, NAKIVO Backup & Replication v7.3 demonstrated backup speeds of 3.2 GB/s. How Does the New Backup Repository Work? The primary difference between the normal (forever-incremental) and the new type of backup repository is easily deduced: while the normal repository stores only increments (i.e., the changes made to a VM since its last backup job), the new one stores VM backup chains consisting of periodic full backups and several increments between these full backups. Does not leverage the global data deduplication feature of NAKIVO Backup & Replication. Let’s consider these mechanisms in more detail. When the normal type of repository is used for VM backup, changed data blocks are written to thousands of different files at the same time. This results in thousands of parallel data streams and scattering data blocks from a single VM across different files in the backup repository. Enterprise-level deduplication appliances, however, are often optimized for receiving data in a limited number of streams (more like dozens than thousands). In the new repository type, all backed-up data blocks are arranged into a limited number of files for each VM: one full backup file and one additional file for each increment. Therefore, when a VM backup job is run, the number of streams is limited to one per VM. As you know, NAKIVO Backup & Replication has a convenient data deduplication feature designed to reduce the size of your VM backups. However, if you are using large servers that have built-in data deduplication functionalities, like EMC Data Domain, HP StoreOnce, NEC HYDRAstor, or Quantum DXi, they might “compete” with NAKIVO Backup & Replication to deduplicate your VM backups. This might compromise the overall backup performance. When you choose the new type of repository, NAKIVO Backup & Replication turns off its built-in deduplication feature. Therefore, deduplication will be performed only by the deduplication appliance itself, preventing conflicts. Using periodic full backups means that in case of recovery, you will have a very recent full backup to recover from. It improves the speed and reliability of recovery, as only a few increments will have to be combined with the full backup file. With the new type of the repository, freeing up space in your storage is as easy as manually deleting full or incremental backup files. Older backup files will also be deleted automatically after exceeding the limits you set in your retention policy. When a VM backup is deleted, unoccupied spots appear in the normal repository where the corresponding data blocks were previously stored. These spaces can’t always be filled with new data blocks, and that’s why periodic space reclaim is needed. Because of the new repository’s different approach to file storage, no space reclaim is required. 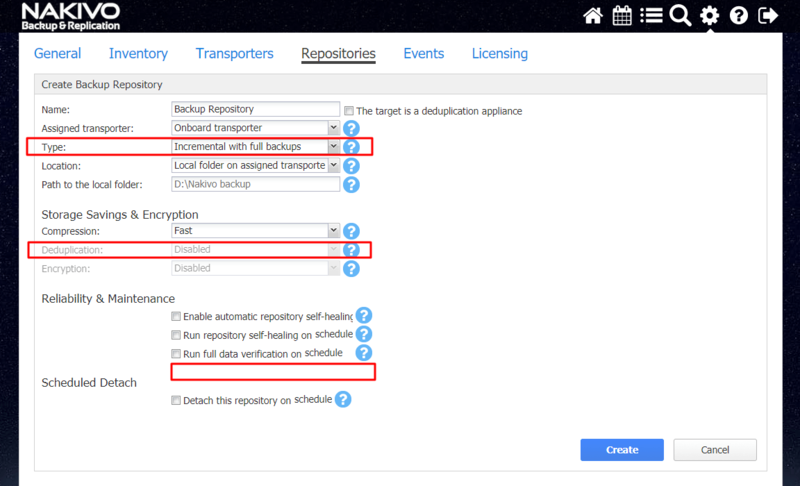 To start using the new type of repository, go to Configuration >> Repositories >> Add Backup Repository >> Create new backup repository. All the other settings can be configured as usual, except that the space reclaim and deduplication options will not be available. Your choice of VM backup repository type in NAKIVO Backup & Replication should depend on the particular needs of your company. Each type has its own advantages, and it’s impossible to say that one is better than the other. The availability of both options gives you the flexibility of choosing the one that will work best in your environment. In terms of the other useful features of NAKIVO Backup & Replication, both repositories provide equal opportunities and convenience. Download NAKIVO Backup & Replication v7.3 with deduplication appliance support now!